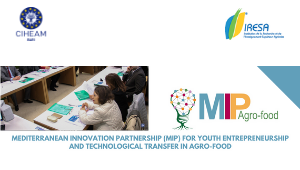 On 29 and 30 November 2018, the annual meeting of the Mediterranean Innovation Partnership (MIP) Network for youth entrepreneurship and technology transfer in the agro-food sector, co-organized by CIHEAM Bari and IRESA, will be held in Tunis. The objective of the meeting is to share and discuss the preliminary results of the 2018 MIP Survey - (second annual report of the network) “Innovation processes in the Mediterranean: actors, policies and future prospects of the innovation chain” – with a special focus on social innovation in the Mediterranean, as an element of change in the approach to local development both for enterprises and for communities. The MIP Representatives from Albania, Algeria, Egypt, Jordan, Lebanon, Morocco, Palestine and Tunisia will participate and share their country report including information on innovation support organizations (ISO), national innovation policies and a focus on social innovation. IRESA will be represented by its president, Elies Hamza, who is currently the Tunisian delegate to the CIHEAM Governing Board. The meeting will also be attended by Lorenzo Fanara, Italian Ambassador in Tunisia. CIHEAM Bari will be represented by the Director, Maurizio Raeli, the Deputy Director Biagio Di Terlizzi, and the experts Damiano Petruzzella, Jocelyne Jawhar and Annarita Antonelli.